It’s commonly accepted as fact that the horror genre has frequently portrayed queer individuals (along with women and minorities) in a less than flattering light, and it’s all too easy to see why: films like DRESSED TO KILL (1980) and SILENCE OF THE LAMBS (1991) depict transgender people as mentally-unstable murderers, while the bisexual bloodsuckers of VAMPYROS LESBOS (1971) and THE HUNGER (1983) exist solely for the titillation of the straight male viewer. Gay men haven’t fared much better, what with directors as prominent as Alfred Hitchcock offering up subtext-heavy whammies like ROPE (1948) and STRANGERS ON A TRAIN (1951) that equate homosexual longing with destruction and death. Yet, when examining the bigger picture, horror, more often than not, aligns itself with the outsider, and is a genre of subversion—rather than conservative puritanism—and, yes, queerness. In this series, we will take a look at clearly queer (and not so clearly queer) horror efforts and dissect them: examining their place in the genre at large, whether they fail or champion the queer viewer, and the wider implications of their underlying criticism of a heterocentric culture, if any is present. Yet, it is impossible not to see in the director’s works the sly touches of a filmmaker who joys in fiddling with the rigid structures of heterosocial coupling, openly mocking the more religiously inclined, and reveling in the outsized style of humor that we have come to know as “camp,” which the Oxford English Dictionary first defined in 1909 as: “Ostentatious, exaggerated, affected, theatrical; effeminate or homosexual; pertaining to, characteristic of, homosexuals.” Though the term has come to embrace any entertainment that gives pleasure with its sense of over-the-top-ness or ironic value, camp will always, at its heart, be a queer form of comedic expression forged in the fires of repression. This is easily seen the works of Whale, most famously in BRIDE OF FRANKENSTEIN but also his earlier effort, THE OLD DARK HOUSE. 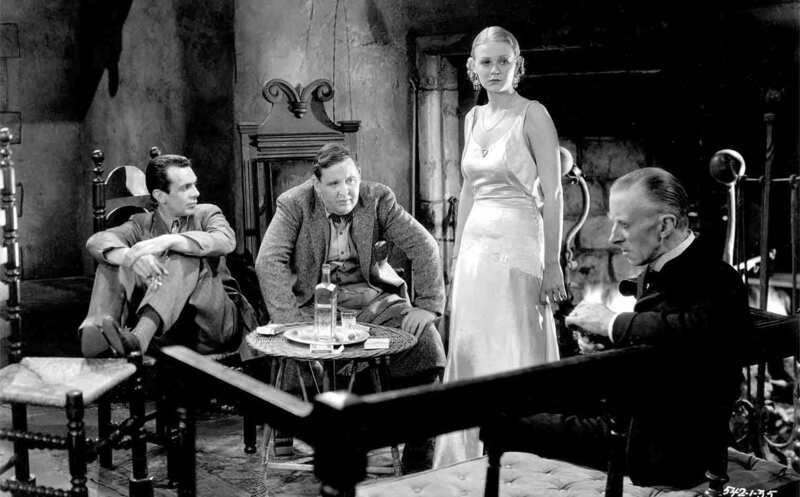 At the start of THE OLD DARK HOUSE (1932), the audience is introduced to a plucky band of red-blooded heterosexuals seeking shelter from a storm. These include Philip Waverton (Raymond Massey), his glamorous wife, Margaret (Gloria Stewart), and their friend, Roger Penderel (Melvyn Douglas), who are eventually joined by the boisterous, barrel-chested Sir William Porterhouse (Charles Laughton) and his traveling companion, Gladys DuCane (Lilian Bond). 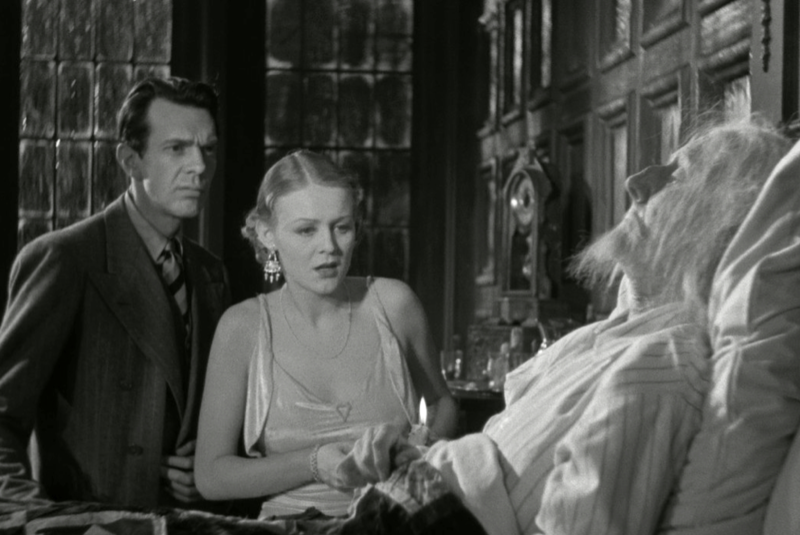 The groups happens upon the titular house, only to discover that it’s the eerie, ancestral residence of the Femm family, of which only weirdo middle-aged siblings Horace (Ernest Thesiger) and Rebecca (Eva Moore) seemingly remain. 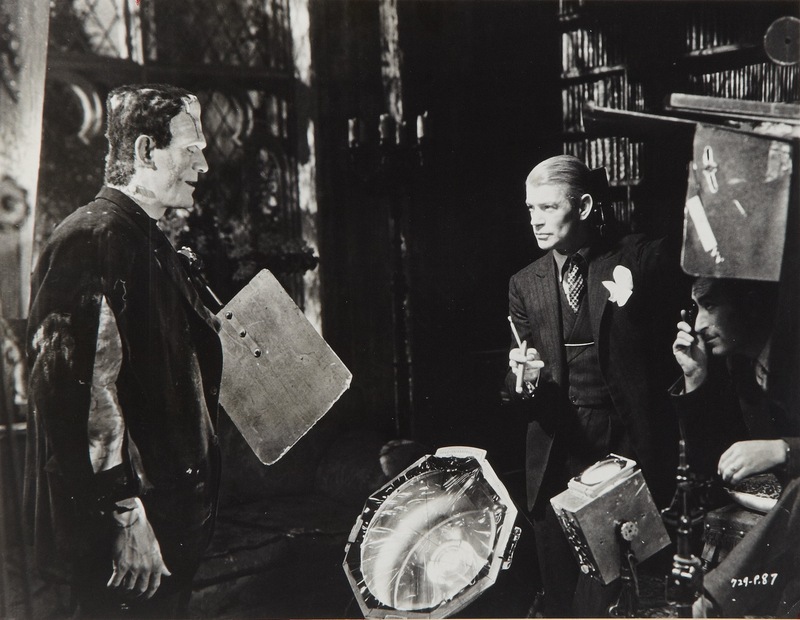 The two are served by a hulking, mute butler, Morgan (Boris Karloff). As the evening wears on, the situation grows increasingly bizarre and risky for all involved. Though THE OLD DARK HOUSE is, from tip to toe, a classically-styled Universal horror film, its tone is a far-cry from Tod Browning’s DRACULA or even Whale’s own FRANKENSTEIN. The setting and characters are familiar, but there’s a parodic edge here—a sneaky, self-aware humor that would be made much more overt when William Castle re-made the film in 1963. Before his famously Mephistophelian turn in BRIDE OF FRANKENSTEIN, Whale cast his theater cohort Thesiger as the ghoulish, irreligious Horace Femm. The lisping, urbane-bordering-on-effeminate stage actor serves as the perfect foil for Moore, who plays his draconian sister Rebecca with a masculine coarseness. The siblings are broadly played, all the better to fill the creepy, cobweb-strewn mansion that serves as their stage. Both exhibit signs of sexual repression. When Margaret goes to change out of her wet clothes, Rebecca admonishes her character, saying “You think of nothing but your long straight legs and your white body and how to please your man,” as she fingers the hem of her satin dress and eyes her viciously. Soon after, the character heavily implies that an incestuous, lesbian desire led her to murder her younger sister in her bed, a revelation that will surprise no one having seen the way the Rebecca seems to devour Margaret with her eyes while roaring about sin and damnation. Horace serves as puritanical Rebecca’s mirror opposite, obviously indulging his “depraved” desires far more readily than she, and relishing the discomfort of their guests with his own dandified air of menace. To the contemporary viewer (and once can only imagine, viewers at the time) THE OLD DARK HOUSE’s most surprising touch comes in the form of Elspeth Dudgeon as the bed-bound Sir Roderick Femm, reclusive patriarch of the family. In the credits, Dudgeon is re-christened “John,” though it’s easily gleaned that the whiskery, ancient character is played by a high-pitched, elderly woman in drag. All at once, the family’s unconventional surname seems smirkingly apropos. Though some sources say the casting decision was borne out of a lack of readily-available, appropriately-aged male actors, Sir Roderick’s single scene throws the already conspicuous queer elements in THE OLD DARK HOUSE into sharp relief. Though the house’s visitors may be rigidly defined by a largely cisgender, heterosexual exterior world, the Femm household is a queer space where the lines between gender are more pliable than rigid. Of course, in the cultural climate of the 1930s, this relaxed attitude toward gender identity would have been considered dangerous and debauched (Whale’s camp humor certainly helps to cut the bitterness), but THE OLD DARK HOUSE also features a stirring moment of queer affection unfettered by any such need to appease the conservative masses. Sir Roderick reveals that there is a third Femm sibling stashed in the attic, the mad firebug, Saul (Brember Willis), who, naturally, escapes in the film’s third act. After hiding the womenfolk in a closet, Roger must contend with the arsonist, who he kills before he can burn the house down around them. Upon discovering the eldest Femm sibling dead, the monstrous manservant Morgan, in an uncharacteristic moment of mildness, lifts Saul’s lifeless body in the style of a groom carrying his bride over a threshold and ascends the stairs into darkness, exiting the film. Is this mournful, brief tableau indicative of a tender-hearted friendship or something more? For many viewers, this is a rare example of pure queer love from the early days of cinema and a perfect grace note on which to conclude Whale’s campy, gender-bending opus. As the sun rises and suffuses Femm Manor with the “cold light of day,” Horace bids his rattled guests adieu with all the warm geniality of a housewife having just hosted a successful tea party. Though the leads return to their wider world of heteronormative comfort, the Femm house, so threatening to outsiders and touched by apparent madness, is a decidedly queer space. The nature of the horror film means that the queer (in both senses of the word) residents of the Femm household are positively daffy and may harm the interlopers in their domain, THE OLD DARK HOUSE is an example of Whale’s remarkable ability to overturn familiar tropes using macabre humor and camp with a queer edge. A dry-run for Whale’s masterpiece, BRIDE OF FRANKENSTEIN, THE OLD DARK HOUSE exhibits the director’s taste for provocation and displays just how subversive an ostensibly “Hollywood” cinematic product could be in the pre-code era. Wow. I can’t believe that you entirely omitted mention of Charles Laughton’s clearly-coded character. He travels with a hotsie-totsie who who tells her new potential beau that he never bothers her “that way”, and he ever-so-graciously accedes to her desire to move on with this new fellow (with no obvious hesitation or subsequent grief). The script all but spells it out for us.